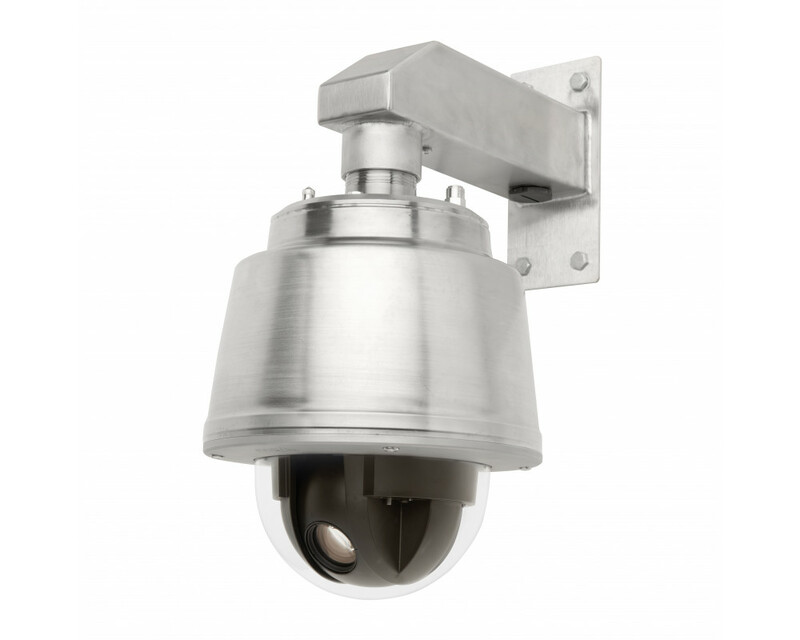 Stainless steel, (SS-316L) pressurized (5psi) Top performance HDTV 1080p compliant, outdoor-ready, IP66, IK10 and NEMA 4X-rated PTZ dome camera with 20x optical zoom. Auto day/night functionality. Continuous 360º rotation and 220º tilt with E-flip. HDTV 1080p (1920x1080) @ 25 fps. Shock detection, autotracking, tour recording and Active Gatekeeper. Highlight compensation. Basic built-in analytics: object removed, fence detector, object counter, enter/exit detection, video motion detection. Including 7 m cable, media converter switch with 2xSFP slots for optical fiber modules, 2xRJ-45, 2xI/O and 12 V in. Brackets and power adapter are not included (several different accessories available).